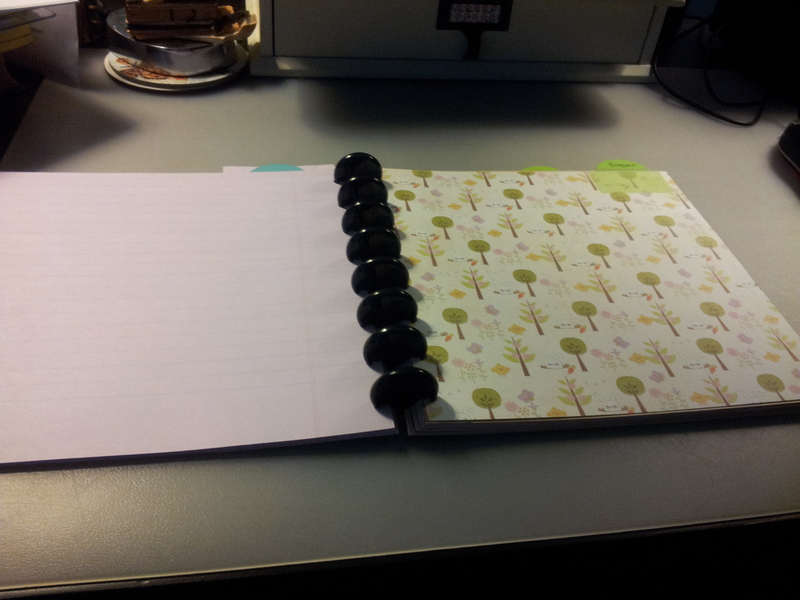 I was fooling around with my ARC hole punch today and made a custom notebook for a game I’m playing at the moment. It involves the care and feeding of dragons and there is a lot of information to remember. 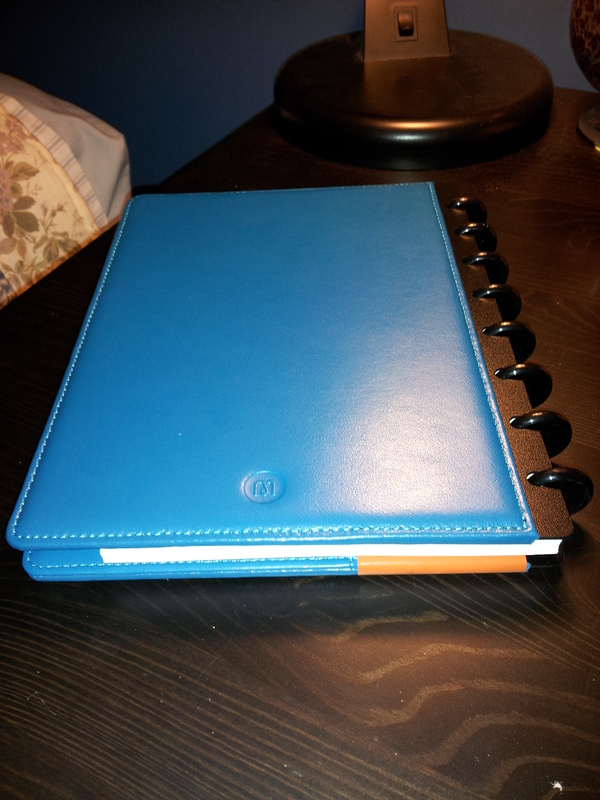 I didn’t want to use one of my many empty journals as I don’t know how long I will be interested in this game and I would hate to “waste” a journal on my notes for a game I no longer play. 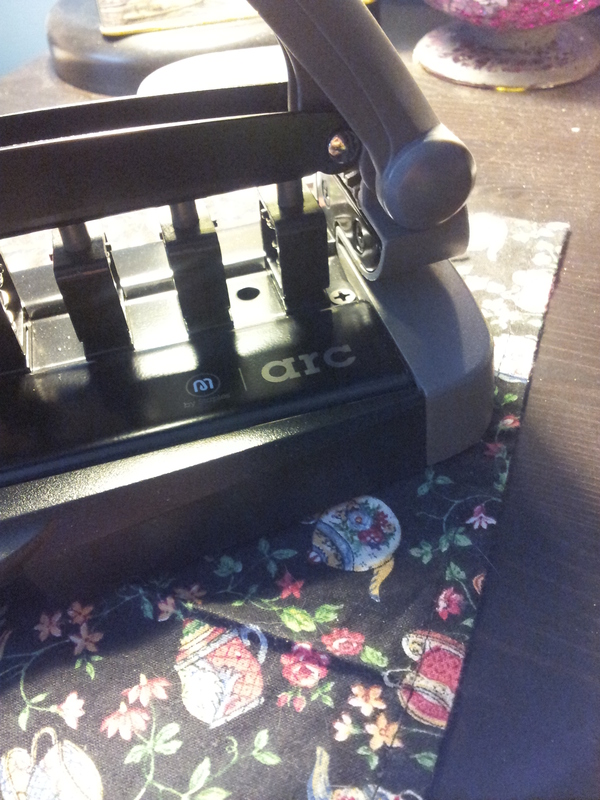 My ARC rings, some scrapbooking paper and my ARC hole punch solved that problem. Here’s a close up of the cover. 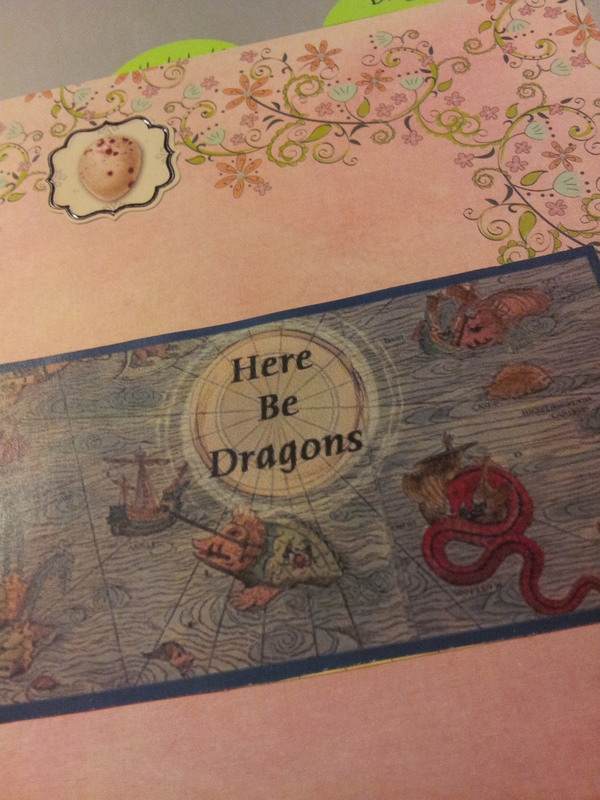 I found the old dragon map online and the egg sticker I already had in my collection. 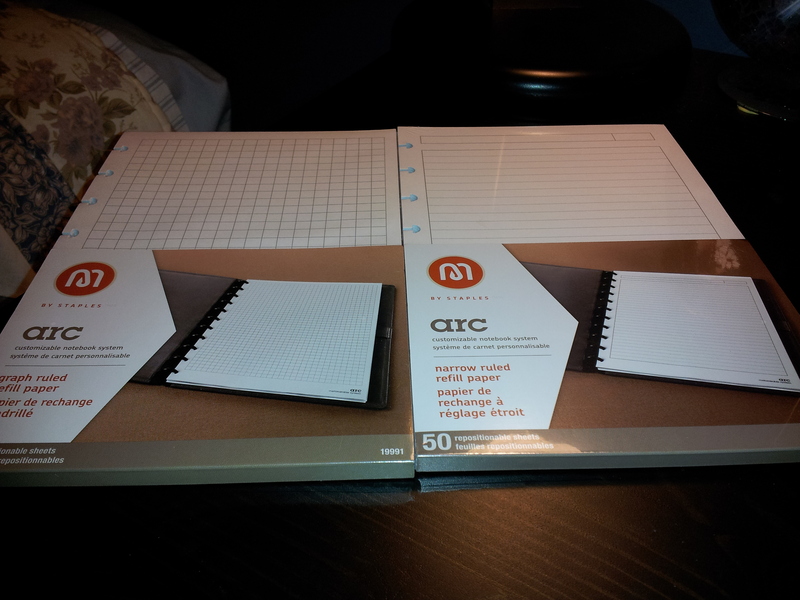 It is an unusual size; it was dictated by the size of scrapbooking paper I wanted to use. 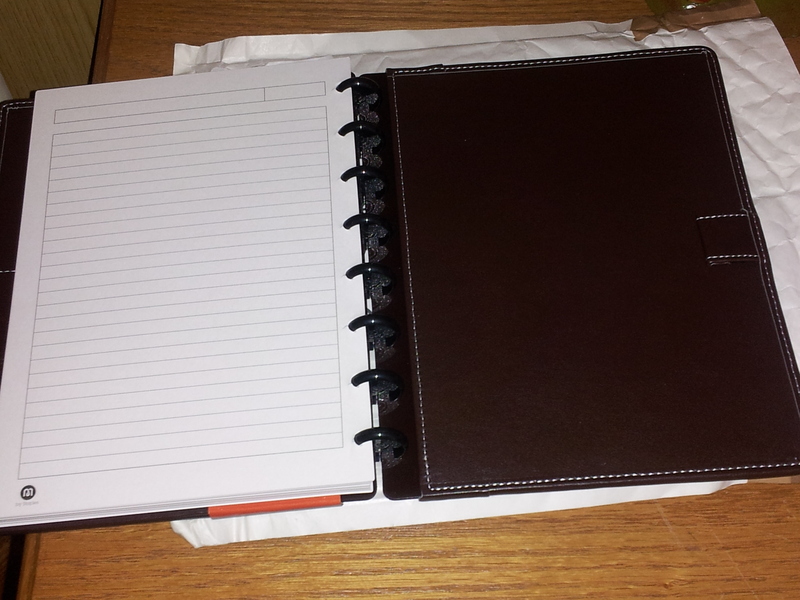 I put purple lined paper and blank, brown craft paper in it, cut to size. 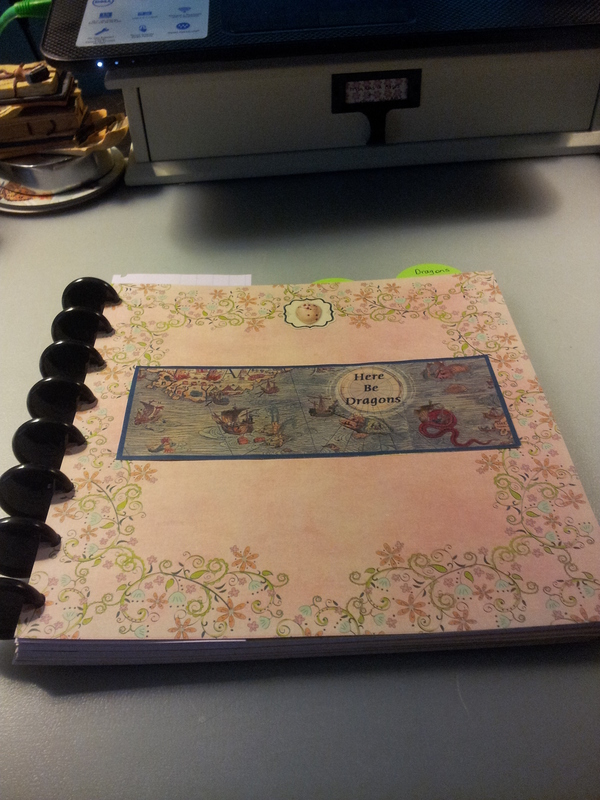 I also used different scrapbooking paper for the dividers, with tabs at the top. The rings are probably too big but they are the smallest ones I have. 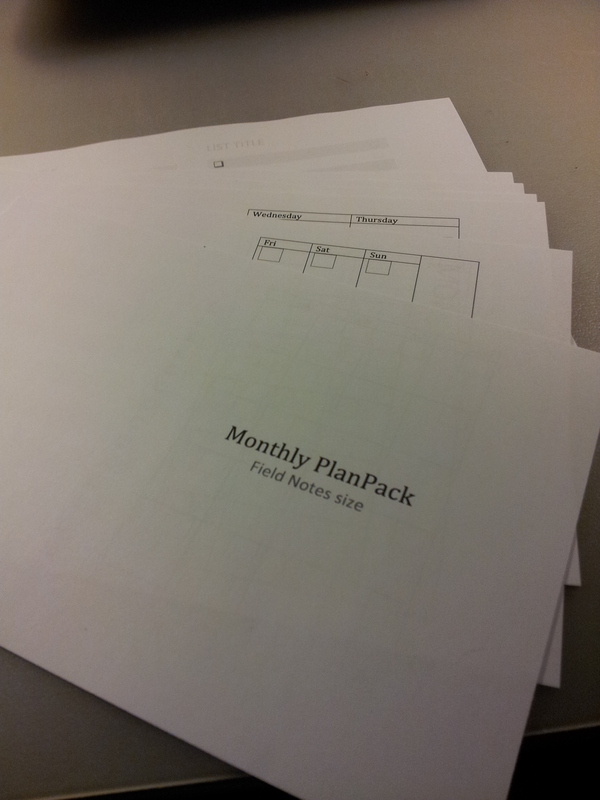 When I finished this notebook I started putting together Ray Blake’s Monthly PlanPack. Ray Blake is a wonderful artist who has many, many free printables on his website, My Life All in One Place. 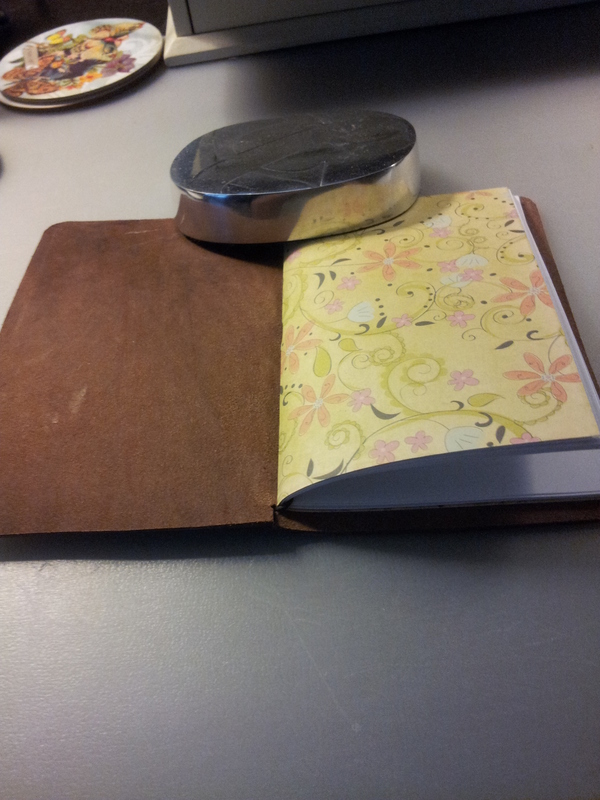 He also makes Midori-style notebooks for sale. I bought one and wrote about it in this post in October of last year. This PlanPack was super easy to print and trim. Here is the cover I created for the insert. I didn’t cut the edges properly so some of them stick out, but it doesn’t bother me. And it’s brand new so it doesn’t lay flat yet. The printable produces two booklets. It starts with a blank month. Followed by 6 blank weekly layouts. And then the rest of the booklet is devoted to lists for whatever you choose. 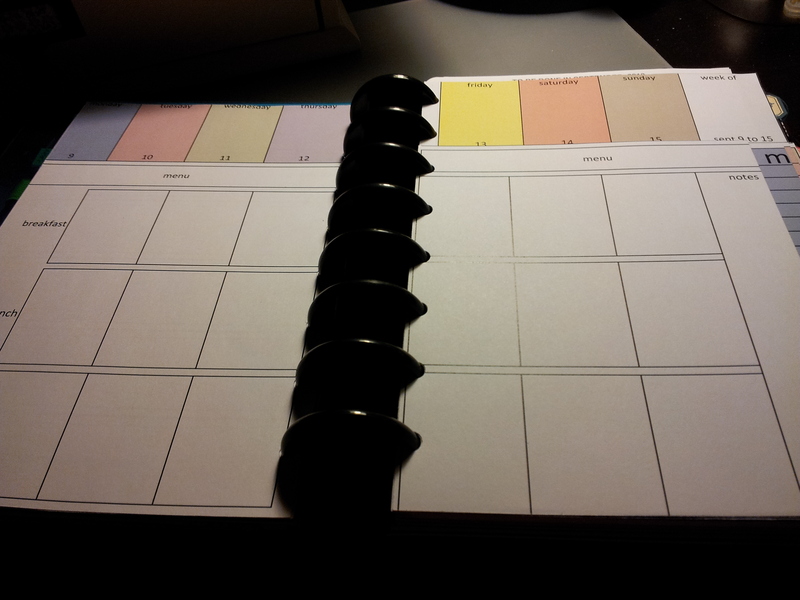 I am not planning to jump into this format right away; I’m happy with my Flex Planner. But I have a lot of fun putting these type of things together and it might come in useful if I move into a smaller purse (which I dream about but never actually happens). Check out Ray’s selection; he makes truly professional-looking and incredibly useful printables for your Midori or Midori-style notebook covers, in a variety of sizes. 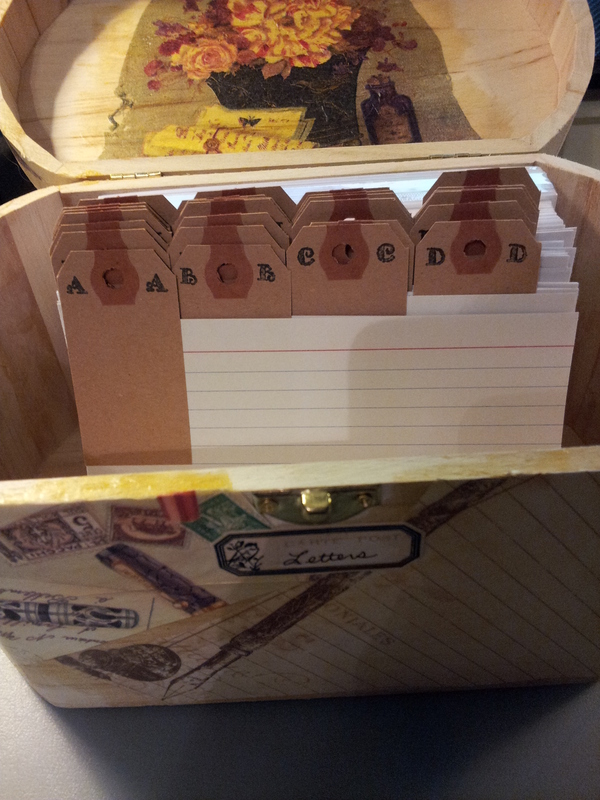 I wanted something more interesting than a recipe box but not as big as a conventional card file (one that might fit a shoe box – I don’t have that many correspondents). 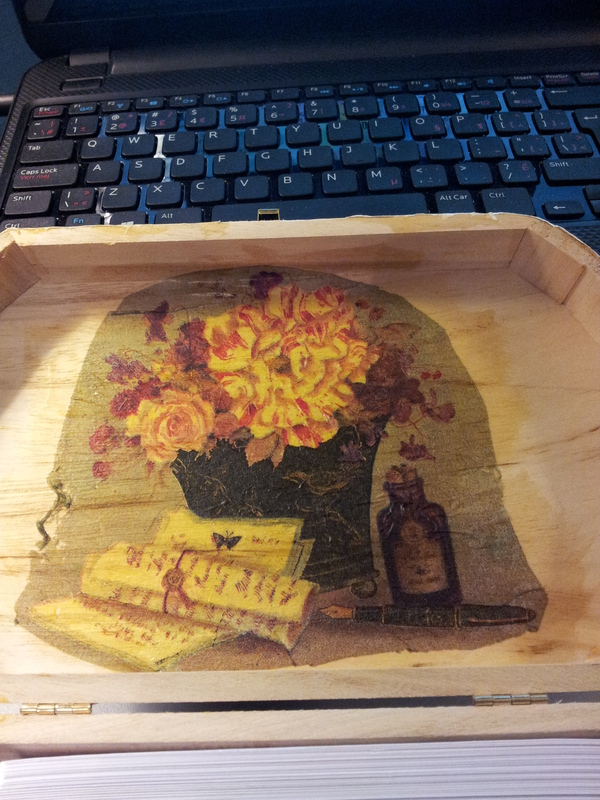 I saw this rough wooden box in Michael’s and thought it was perfect. 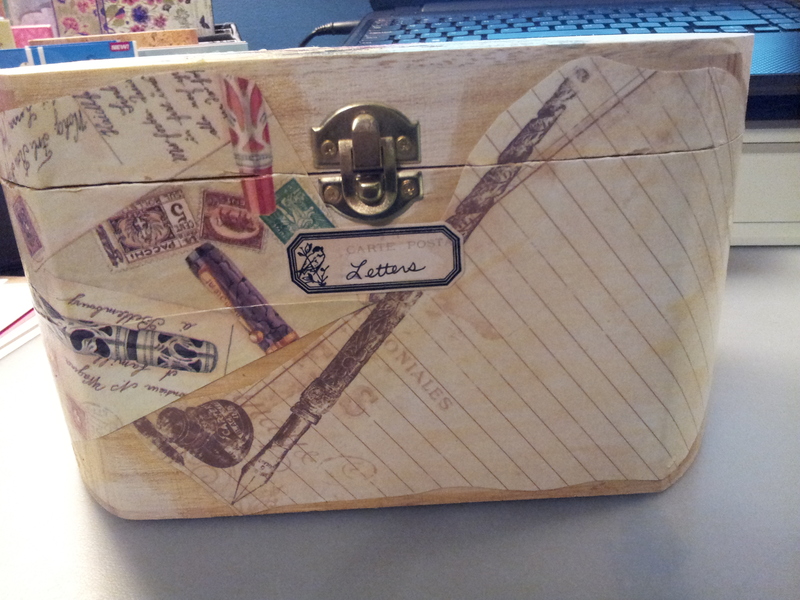 I bought a bottle of Mod Podge and some foam brushes and went to town decoupaging the box. It’s not finished yet; I will do another post when it’s done. I intend to cover the entire thing (or as much of it as I’m capable of) with interesting paper I have collected over the years. 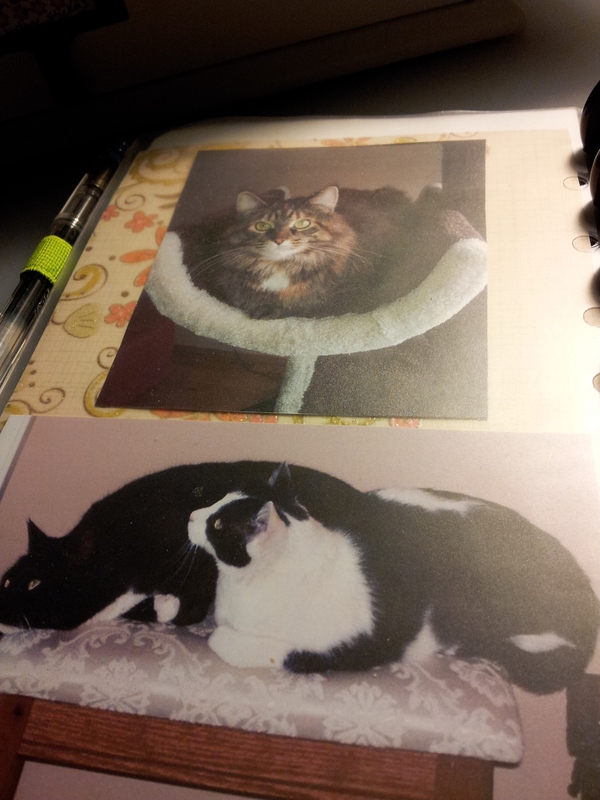 In the picture above the paper on the front right is a page from my Bo Bunny Miscellaneous Me collection of notepaper. 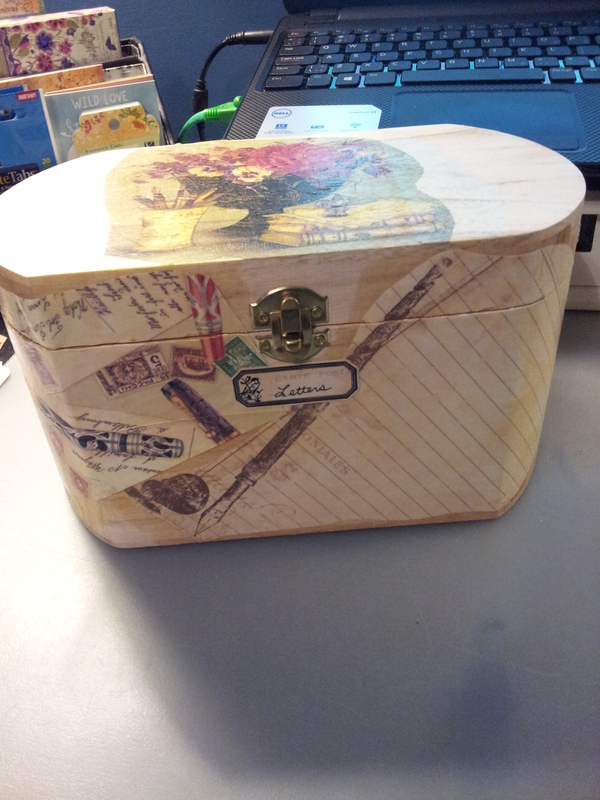 I cut it into an interesting shape, laid it on the box, and covered it with the gooey Mod Podge. The paper on the front left is gift wrap given to me years ago. 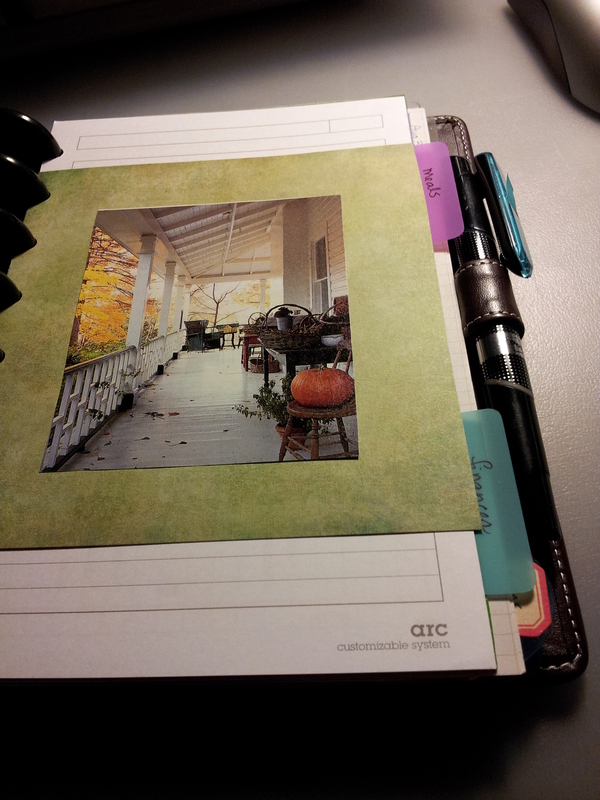 You may recognize it from this post in which I use it as a divider in my planner. 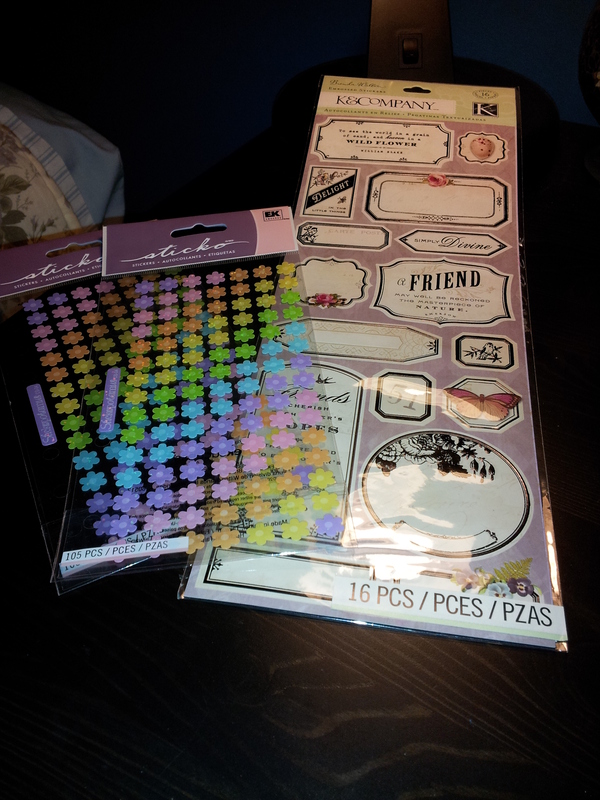 The sticker is one I picked up at Michael’s a while ago. I’ve been waiting for the right project to use them on and this is definitely it. The finished project will probably have more of those stickers. I thought it would be interesting to have the paper cover the edges of the box. I used an exacto knife to cut the box open again after the paper was dry. The image on the top of the box is a napkin, believe it or not. I removed the two layers of absorbent sheet on the napkin and was left with a very thin sheet with the image on it. 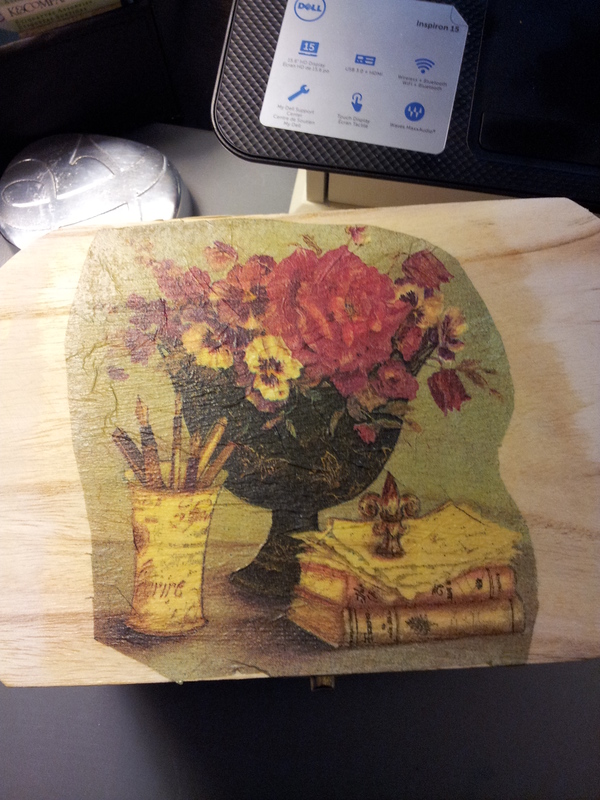 It was tricky to decoupage as it becomes like wet tissue as soon as the Mod Podge hits it. But I’m very happy with the end result. The other side of the napkin had a similar but slightly different design so I put that one on the inside of the box lid. You can see where the napkin started to tear on the left. I’m learning! 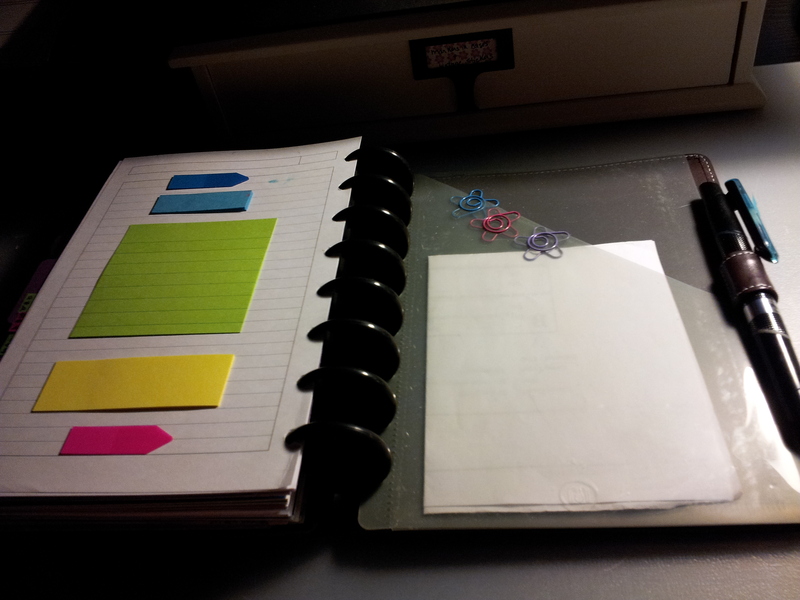 For the card file I needed dividers. 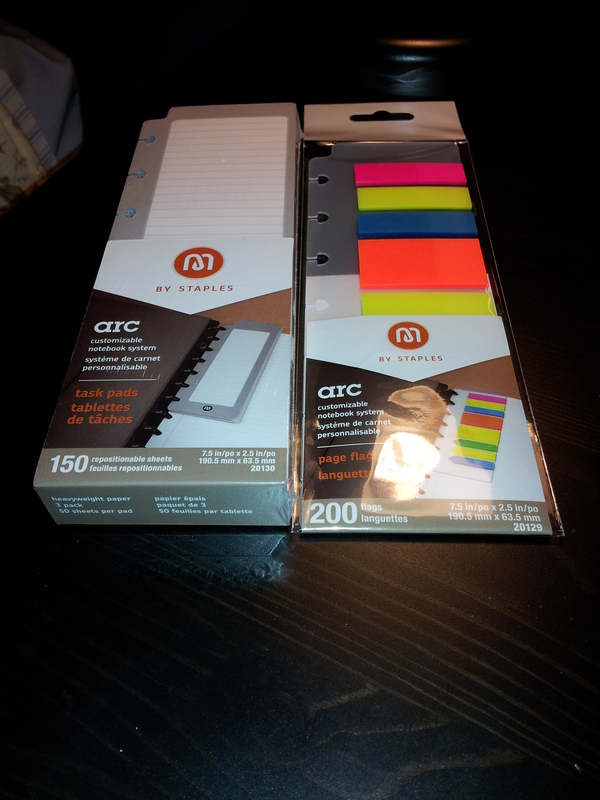 Michael’s didn’t have any so I went to Staples and they only had the brightly colored modern ones; I was hoping for the vintage looking black and tan ones. No luck. 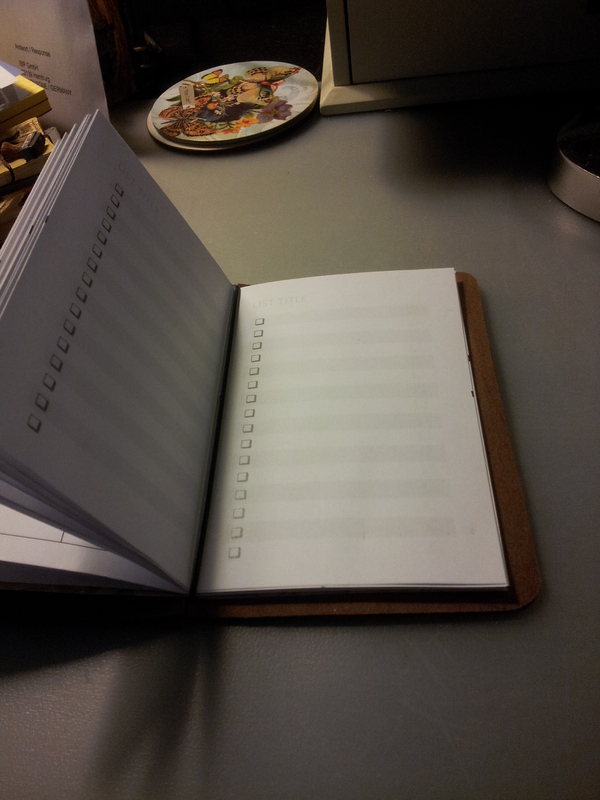 So I made the dividers myself using brown tags. The two-toned brown tags match my colour scheme, such as it is. I used an alphabet stamp set to make the letters. Each correspondent will have their own set of three types of cards: Name and Address on the first, Log on the second, and Letters on the third and subsequent cards. The first card is simply their name and address, and perhaps any extra info about them, like their username on FPGeeks or Youtube for example. The second card, the Log, will be a record of when each letter was sent from me and when I received their reply. The third card, the Letters, will be the details of what I said to them in each letter. I don’t want to repeat funny stories about the cats or my husband or something at work. And each set of cards will be fastened together with an interesting paper clip (finally a use for all those funky paper clips I own!). 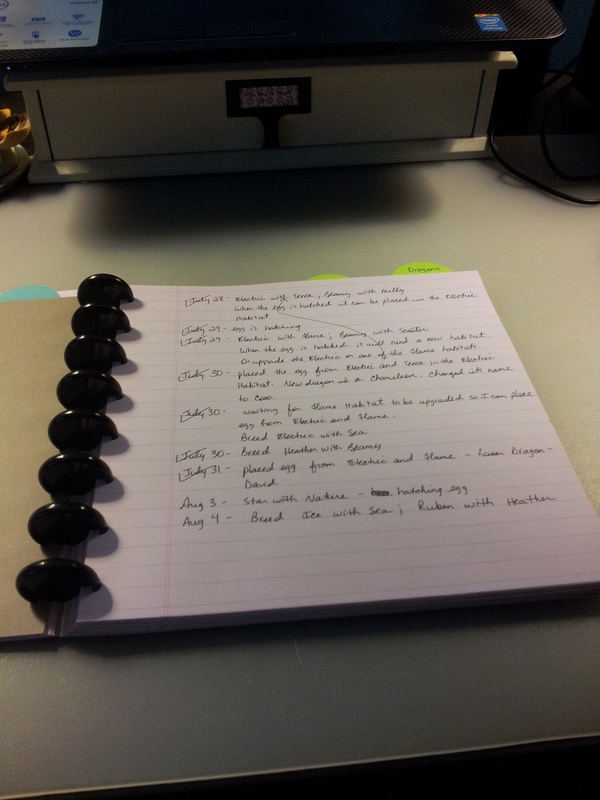 Each paper-clipped set will be filed under the person’s first name, as that is how I will think of them for sure. 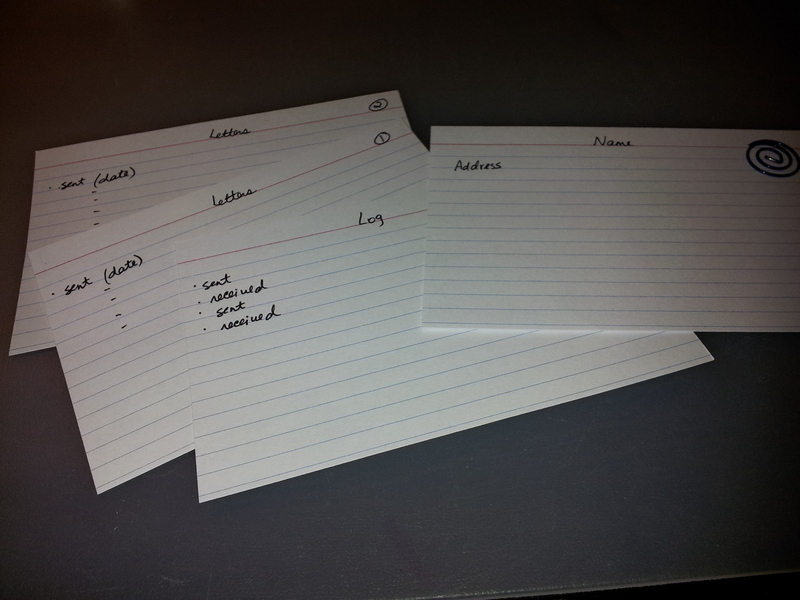 So when I sit down to write a response, I will have their last letter in front of me to answer, but I will also have all of their information from the card file. I’ve been using this system for about a week now and it’s working great! As I said I still have work to do on the box. And after it’s all covered in paper I’m told I should do a final Mod Podge coat, to seal it all in. I will do another post when I’m done. Hope you enjoyed this – I’m certainly having fun playing with paper and glue! You’ll recognize this beauty from my Woven Fabric Arc Notebook post of Aug 25, purchased for and sent to me by the lovely Amanda from arcit.blogspot.ca. You’ll also recognize the book elastic from the Papaya Book of Days post of May 5. 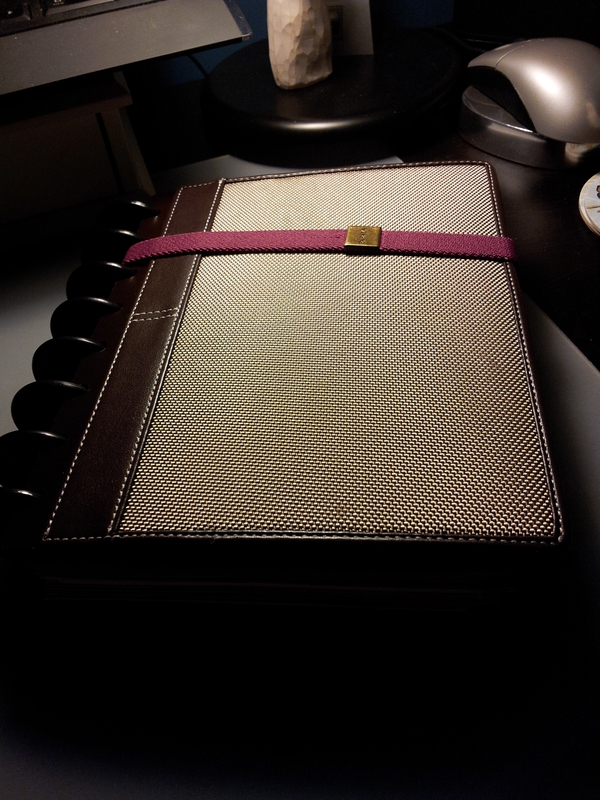 I like the pink with the brown and it works perfectly to keep the book closed. I need something because there is no clasp or attached elastic. I’ve moved into 1.5″ discs. 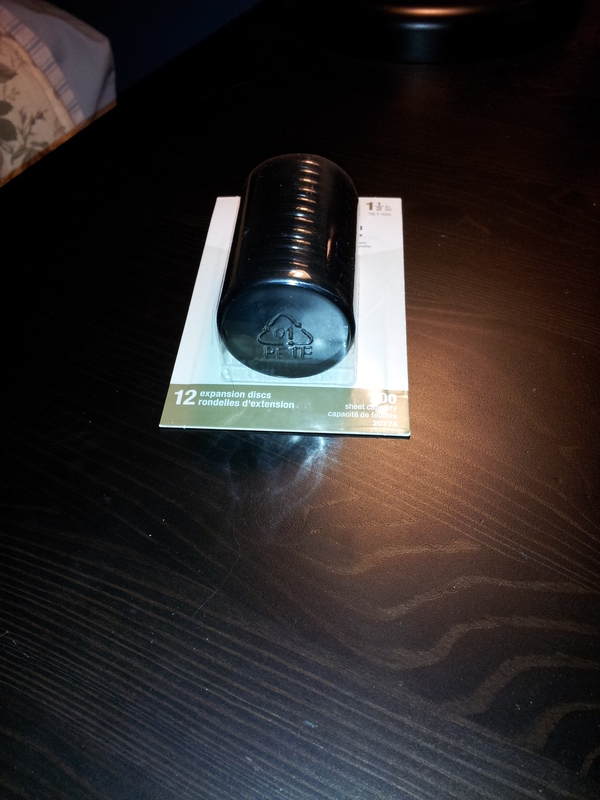 It came with 1″ discs but once I loaded it up the pages were no longer able to move with ease. So it was into the bigger discs. The discs look a little big but they hold so much more. 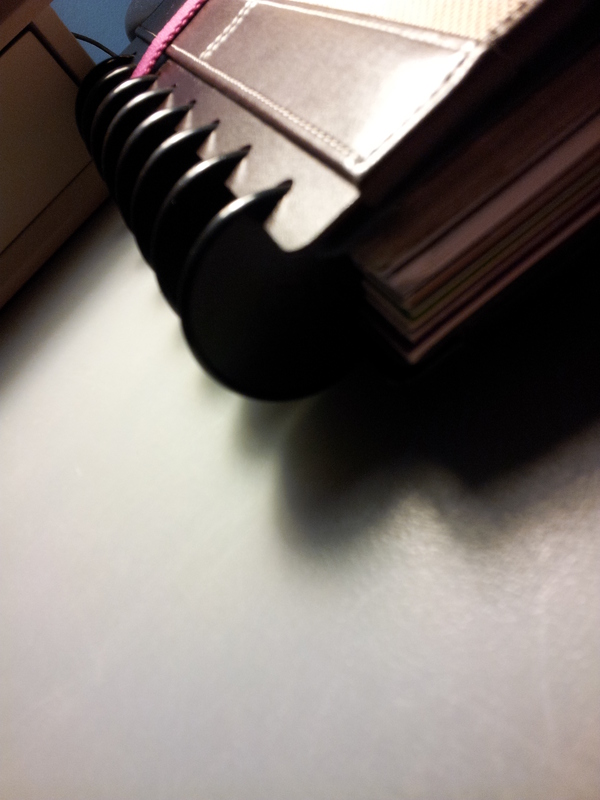 I keep an Arc pocket divider at the very front, to hold bills I need to pay that day or post I need to send. 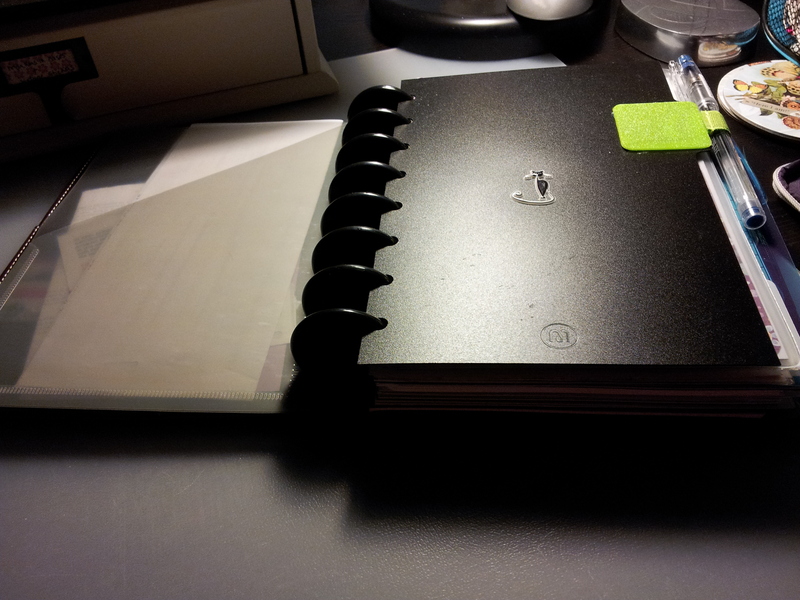 And since the Arc comes with one pen loop I added a Leuchtturm Pen Loop to an Arc index divider which works really well; I can move the index divider if I want, even to a different book. Not that I’m planning any more planner moves this year! 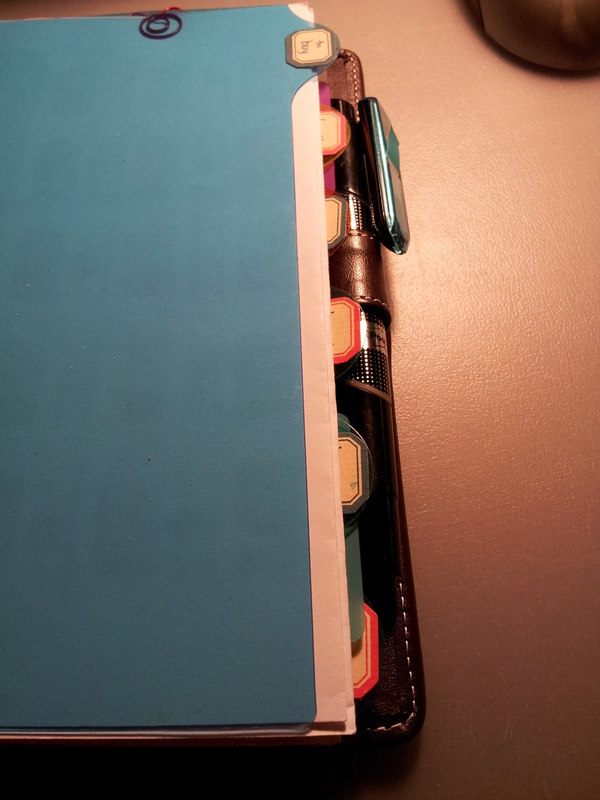 I keep a blue Pilot G-TEC C4 pen in the loop currently. 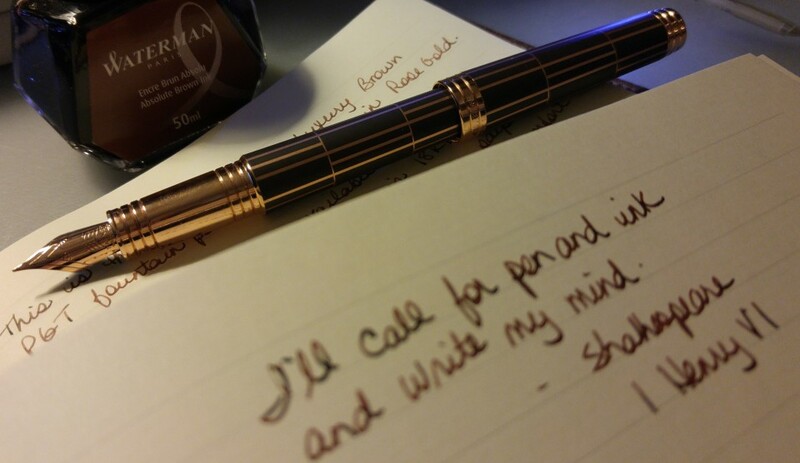 I plan on moving to a Coleto or Slicci multi-pen as I like having different coloured inks to write with. 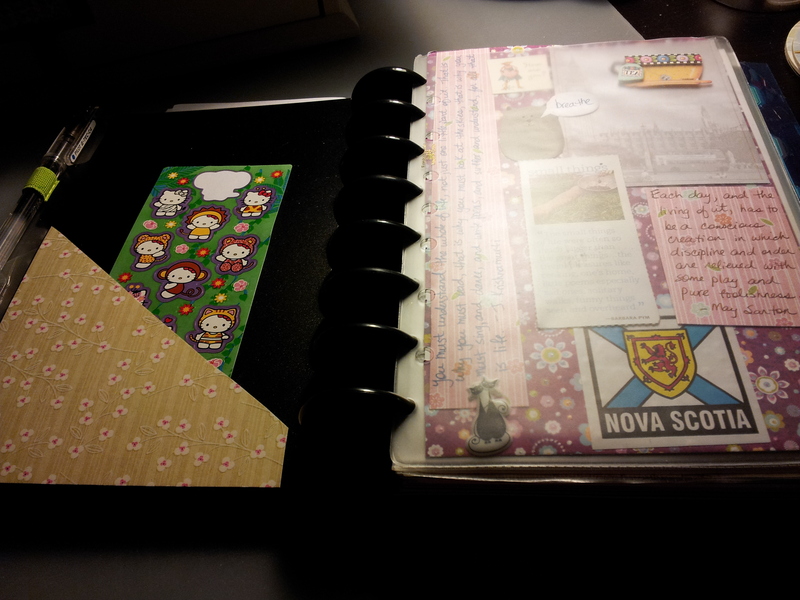 I made the small paper pocket on the left and I keep my Hello Kitty stickers in there. I don’t have much Hello Kitty stuff and was never really into it until my friend gave me Hello Kitty bookmarks for Christmas last year. 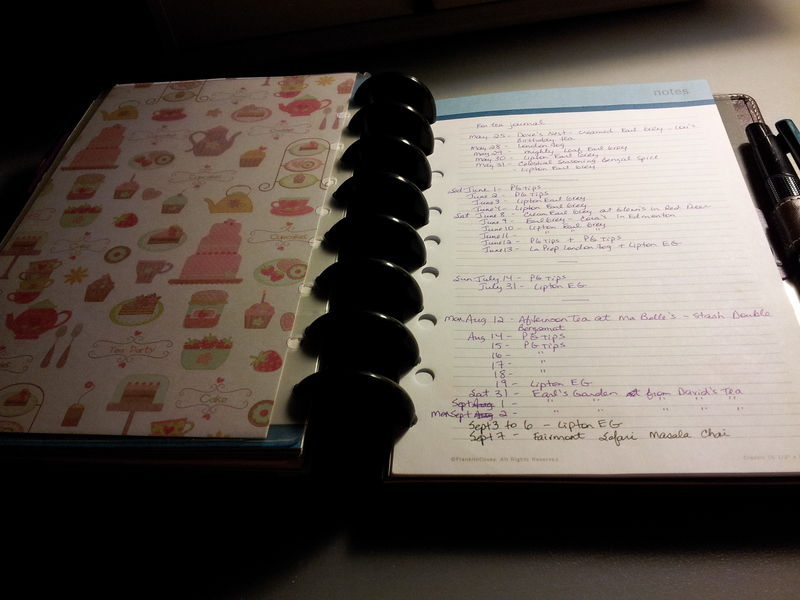 In this photo you can also see an inspiration page with my favorite things on it, including quotes. 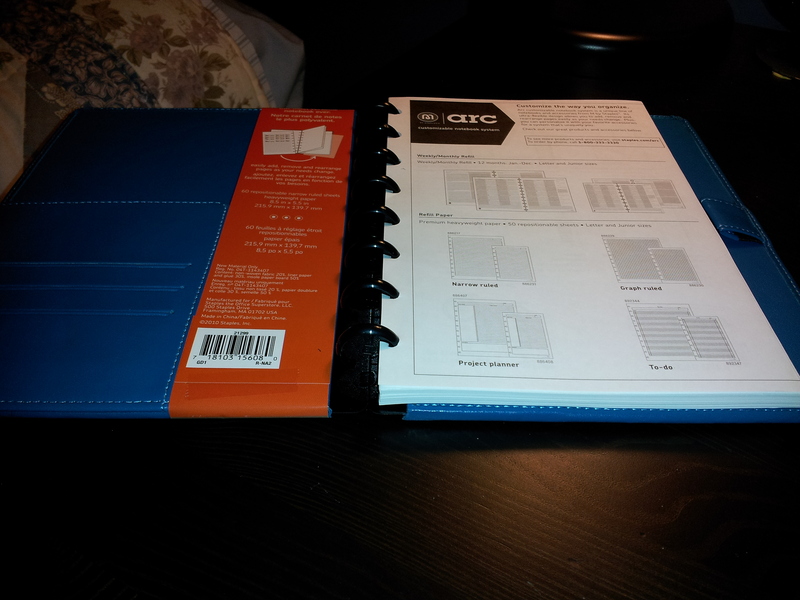 I use an Arc zippered pouch for more stickers that I use in the planner. 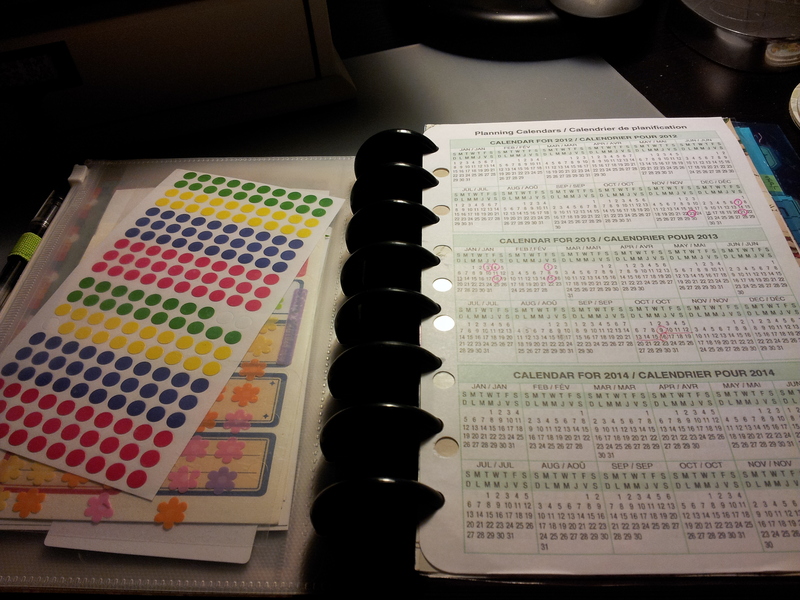 On the right you can see a Day-Timer Yearly Planning Calendar that I liberated from an old planner. 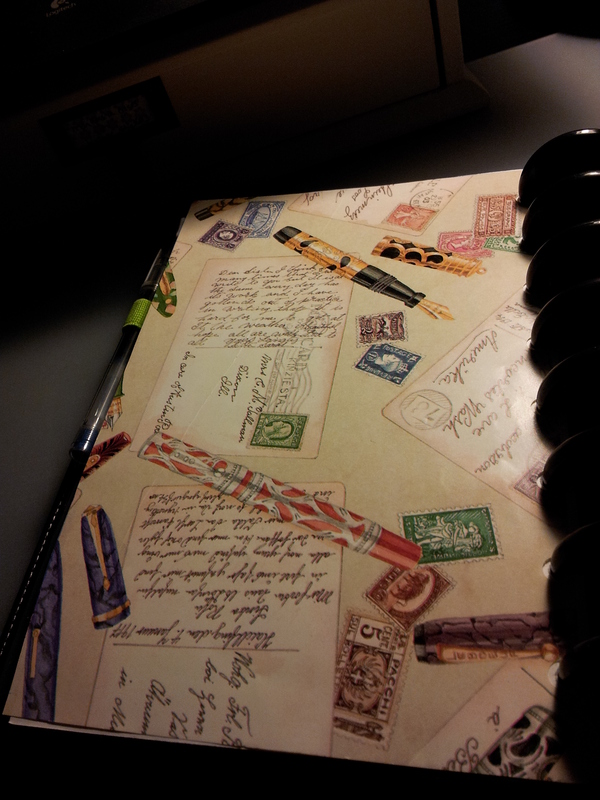 I love this paper and made it into a divider. 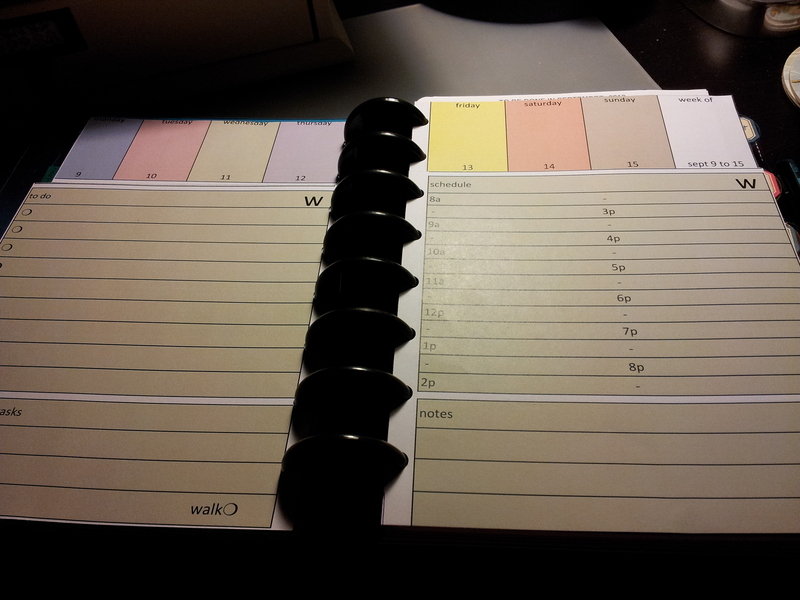 Here’s where we start to get into the actual planner pages (finally!). I created this page and the following weekly pages based on a design on limetreefruits.com. 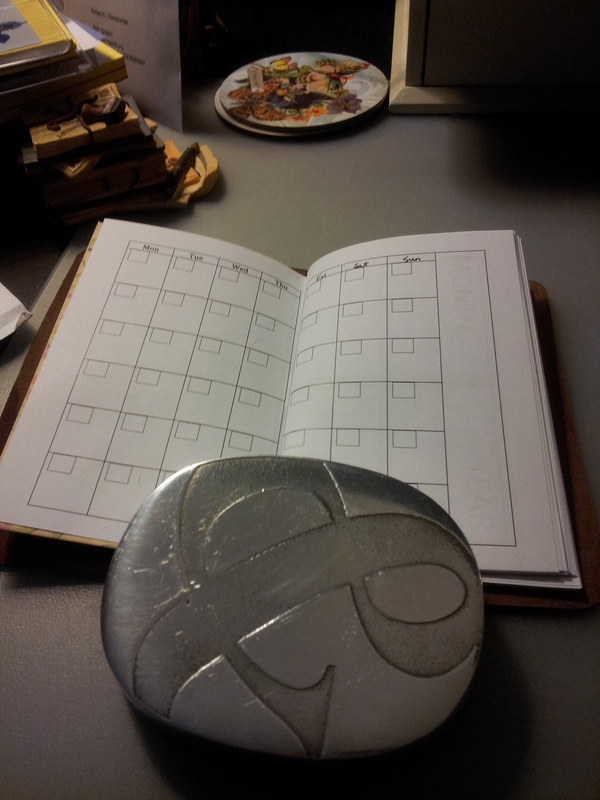 The weekly blocks are laid out along the top of the page. 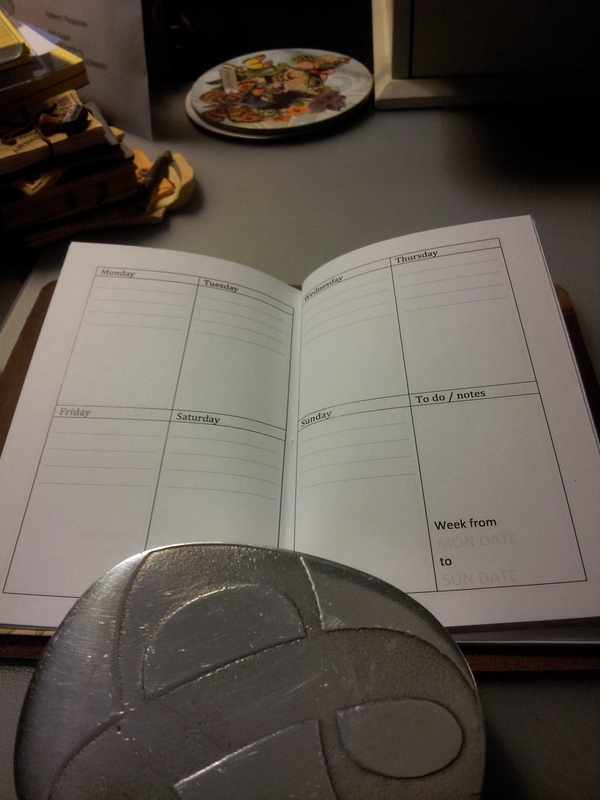 This is the beginning of the week where you can organize the meals for the week, or record what you eat day by day. Each day is cut, above the to do line, and above the schedule line. So you can flip through each day without losing sight of the week at the top. It really is a nifty system. Limetreefruits.com has free printables of this in a hand-painted, water colour themed design which are incredibly beautiful, just not my thing. I changed the schedule to suit me and also added water and walk tracking icons. 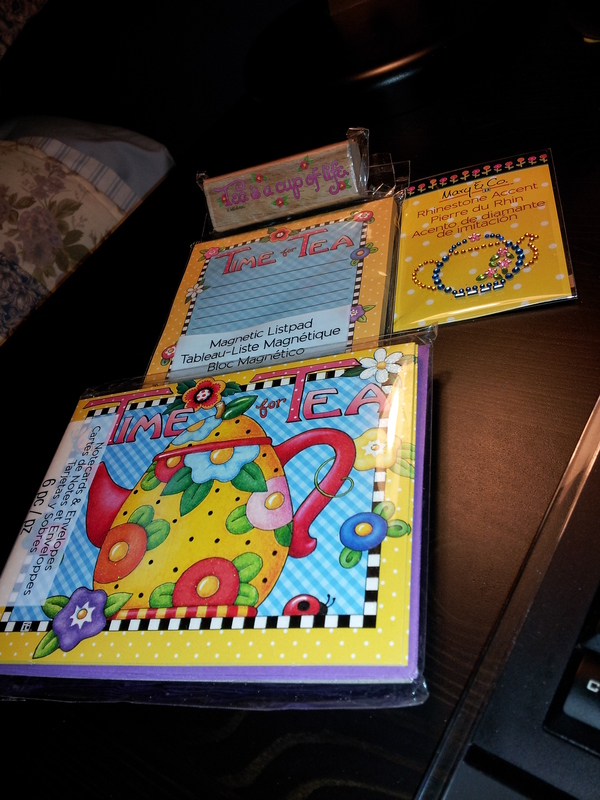 More dividers: to buy, health, bookclub, travel, home and notes. I like to keep note of online retailers who sell certain items and what their shipping terms are. 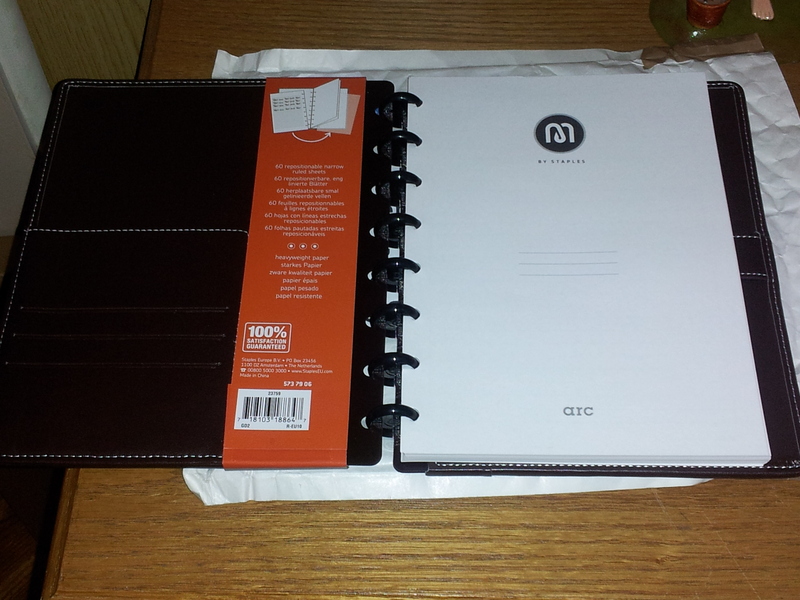 In the home section I keep my menu planning pages and finance pages. The tea section. 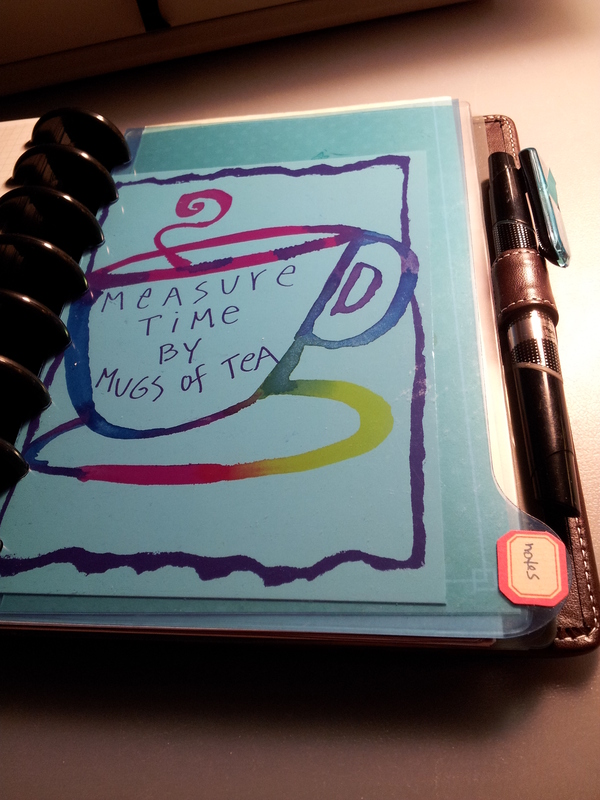 I keep track of my daily tea drinking here, for eventual transcription into my silver filigree Paperblanks journal. 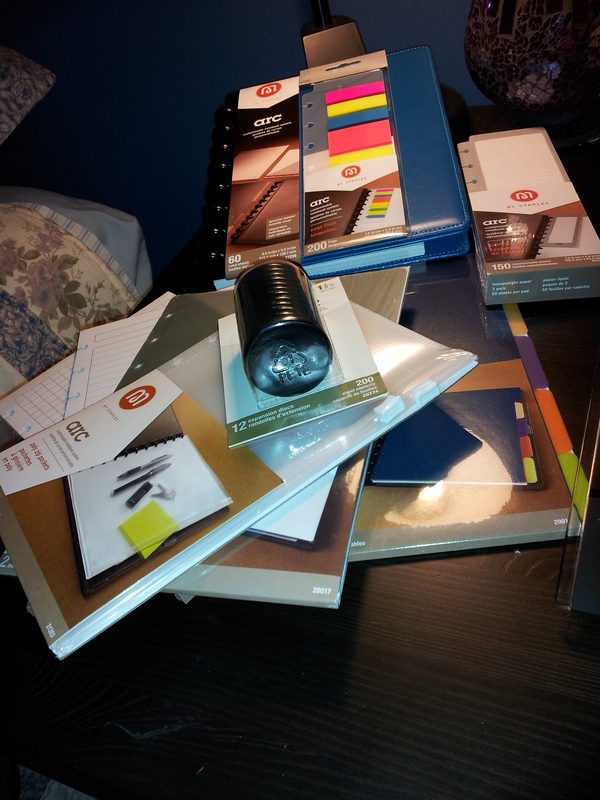 In the back I keep post-its and flags, as well as another Arc pocket divider. In this pen loop I keep a Post-it pen I found at Target. It has flags in the highlighter cap and the other end is a ballpoint pen. 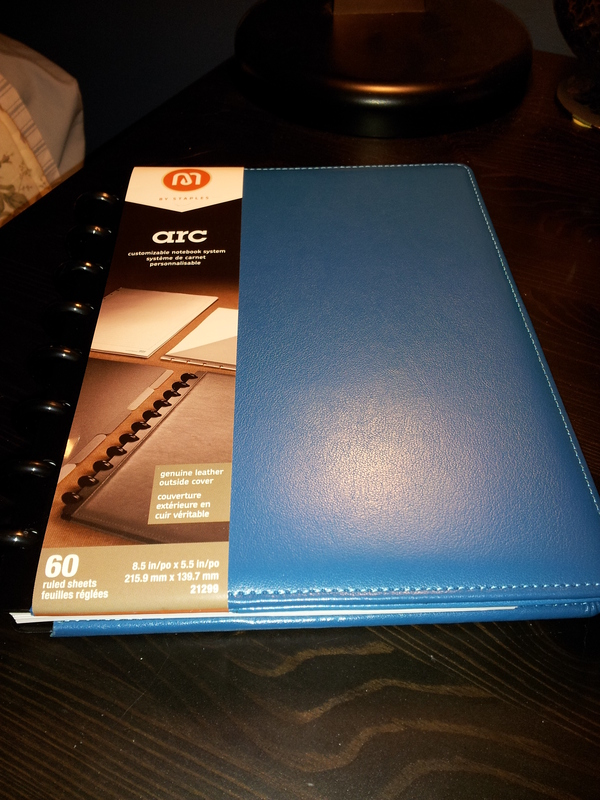 It’s no secret I love Arc notebooks: in my post on July 28 I talked about the blue leather junior notebook and all the accessories; and in my post on Aug 18 I talked about my travel journal which I made using a green poly Arc notebook. 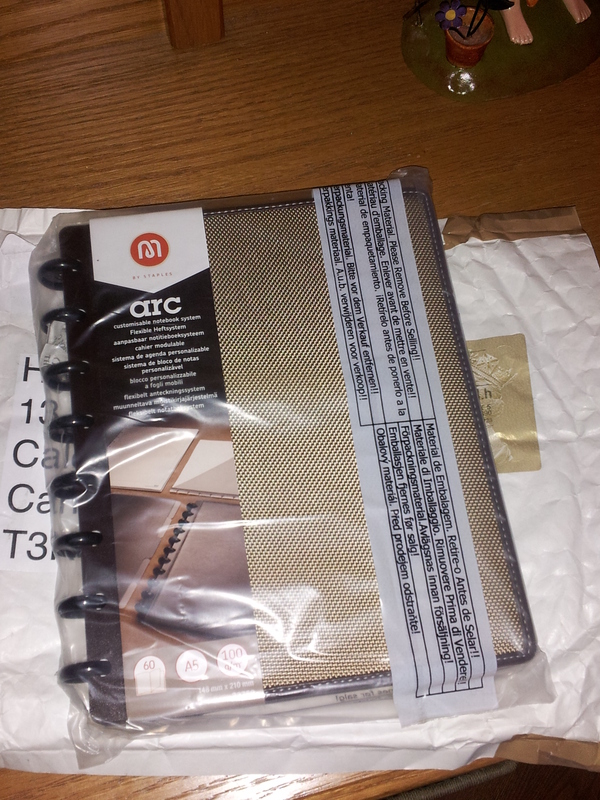 And now I’m going to talk about my new brown woven notebook, size A5, from the wonderful Amanda from http://arcit.blogspot.ca/. She posted how she is always looking for items that are not available in the UK; she is willing to buy items if we are willing to send them to her, and vice versa. She didn’t want the green poly notebook at the time I sent the email, but she was willing to buy and post the woven fabric notebook for me. Plus she had a coupon! 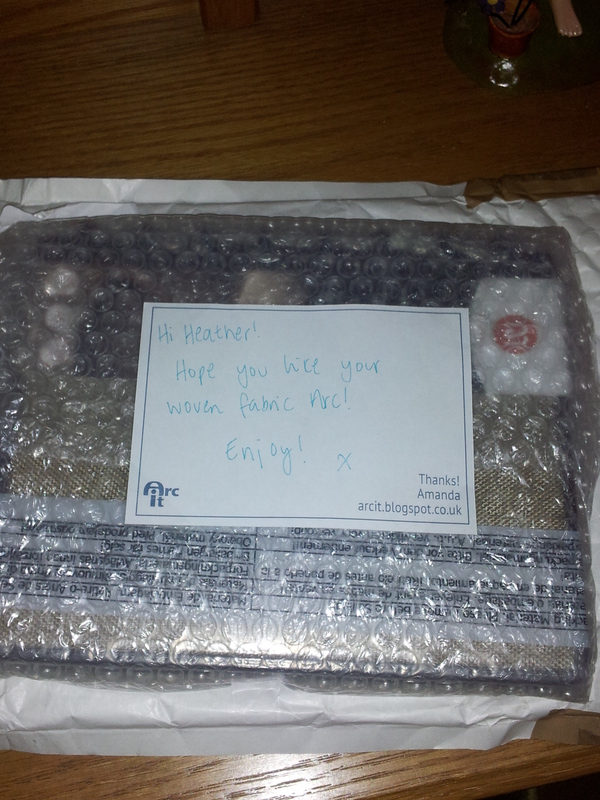 And so after a few emails and paypal payments it arrived in my mailbox! Amanda included a very nice note with the notebook. The bubble wrap came off to reveal another plastic bag. Good for shipping. 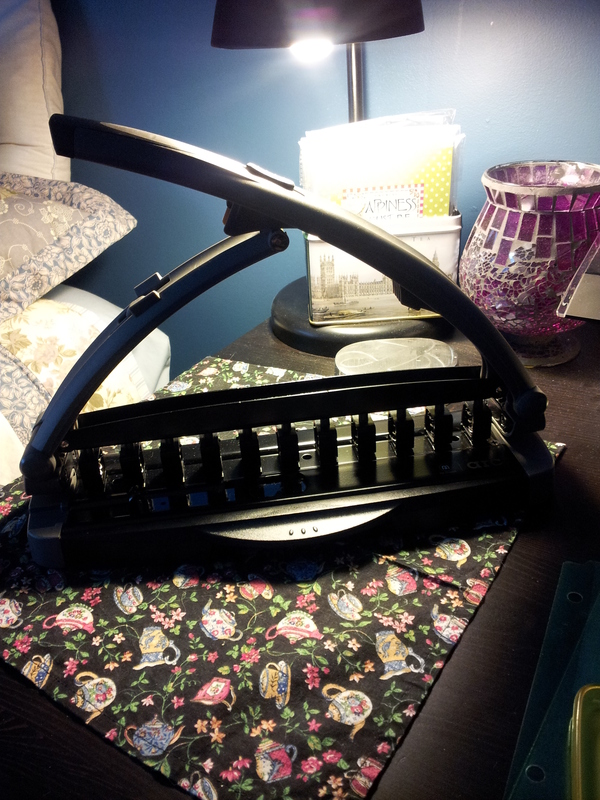 I tore the plastic bag off and could finally feel the notebook. The woven fabric on the front and back is kind of shimmery gold and feels coarse to the touch – but in a good way! The A5 cover is exactly the same size as the covers we can get here in Canada. But the paper is slightly larger – our paper (in the junior size) is 5.5 inches wide, while the paper for the A5 size is about 5.75 inches wide. I really like the white stitching detail. I plan on making this my daily planner. 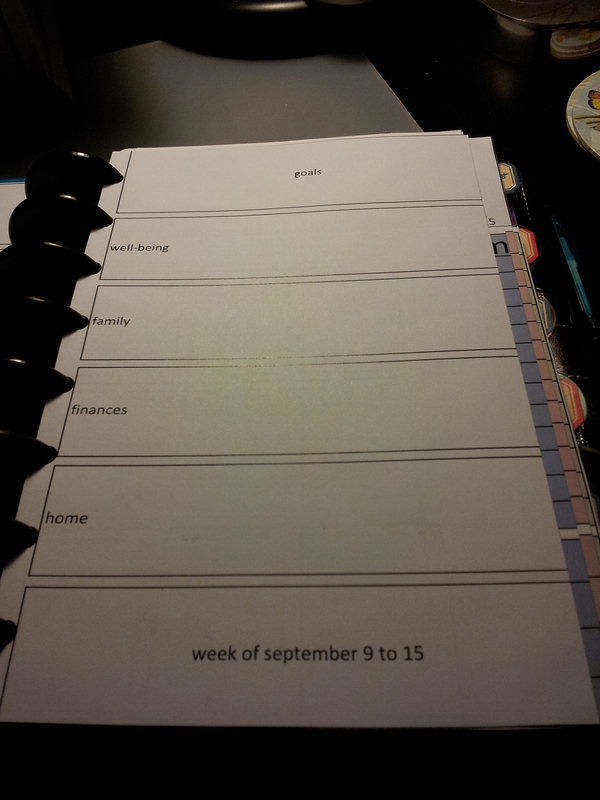 I got the idea from Amanda, who also uses this style for her daily planner. 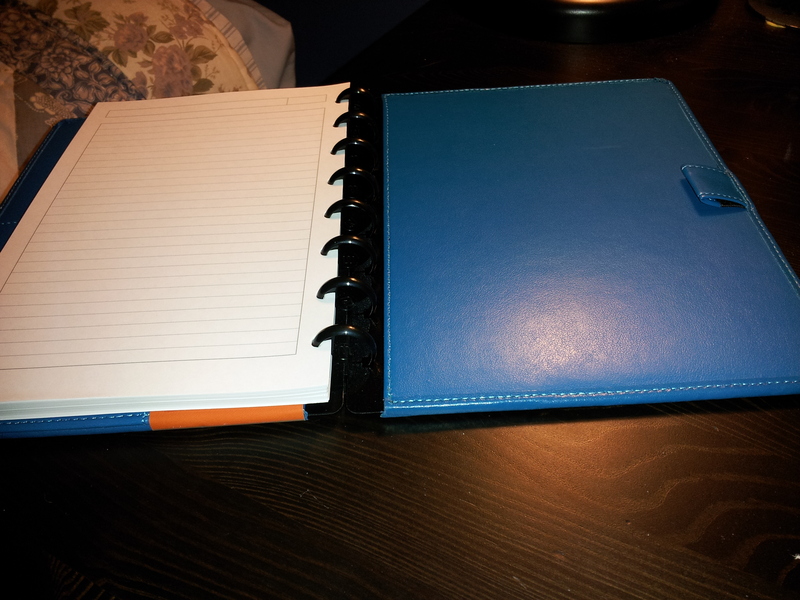 This style notebook has the single pen loop, just like the versions available here. 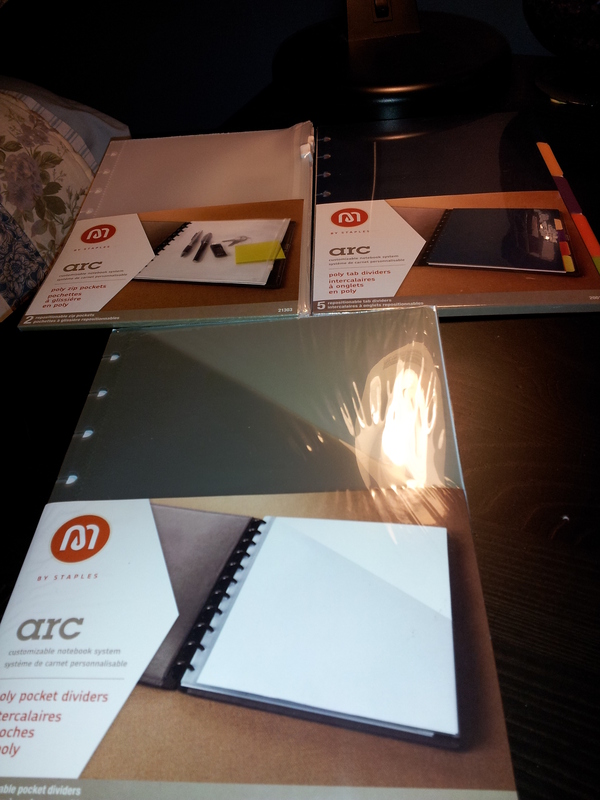 I have yet to see an Arc notebook with two pen loops; that would be very handy. 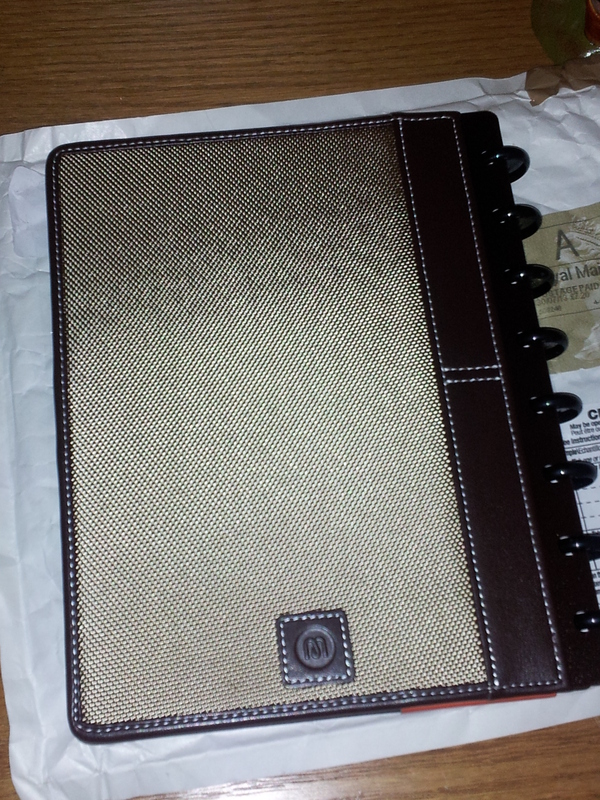 Below is the back cover of the notebook, with the M embossed in brown leather. Nice touch. I’m absolutely thrilled with this notebook. 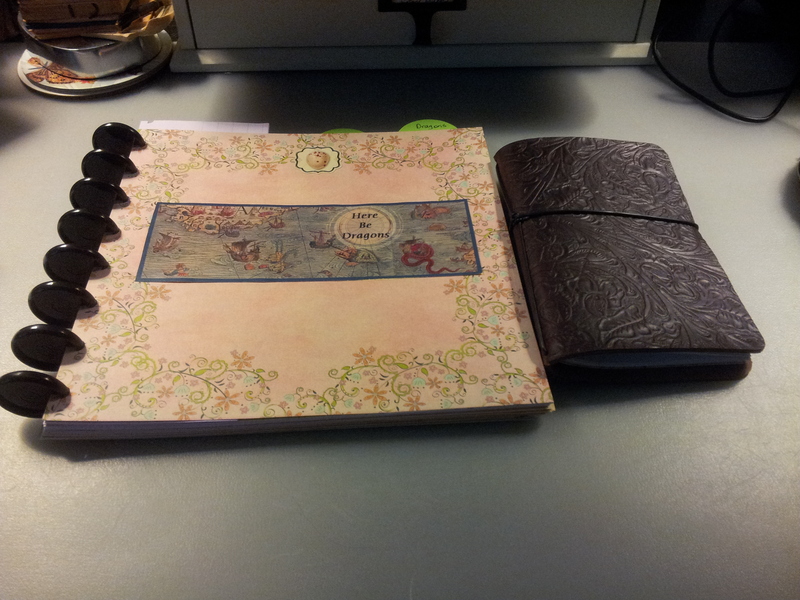 I will do another post about how I’m using it as my daily planner. 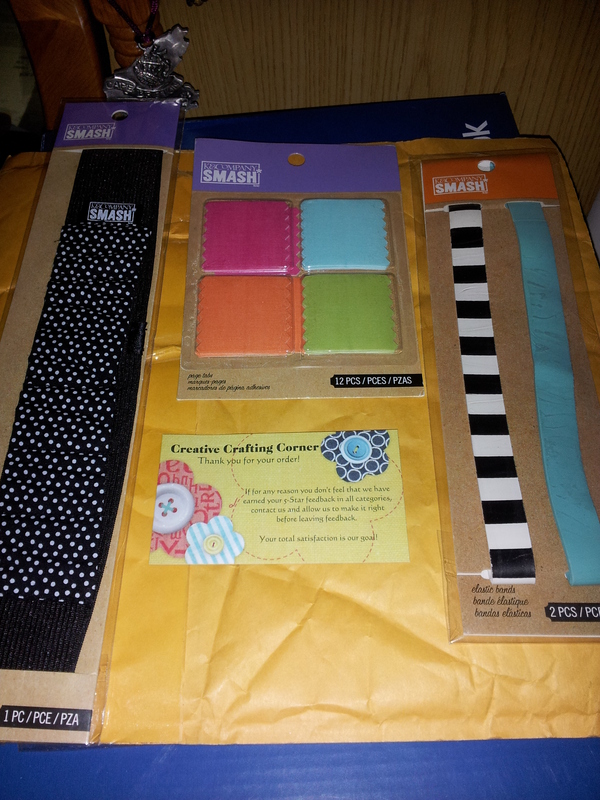 Along with Amanda’s package this envelope arrived from Creative Crafting Corner, with some goodies from Smash: the pen holder, page tabs and elastic bands. My local Michael’s never seems to have these items. 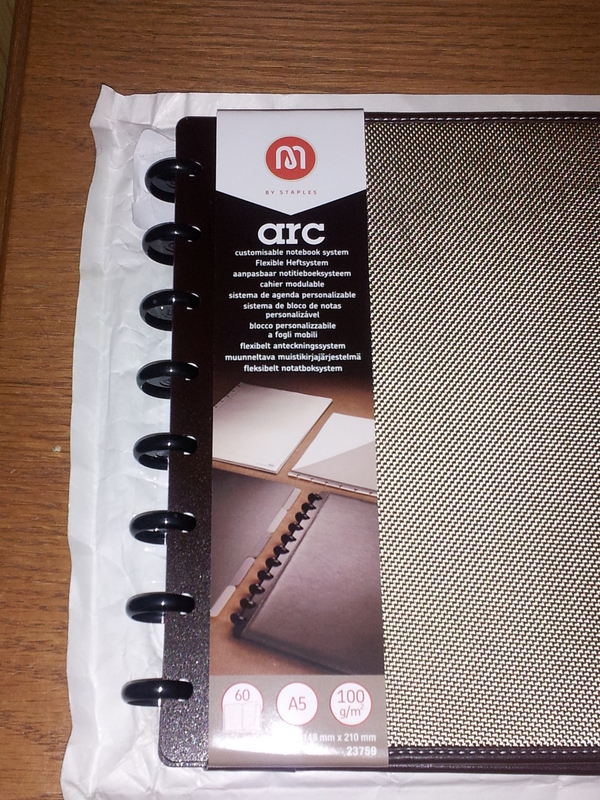 You can check out the woven fabric Arc at the Staples uk page here.